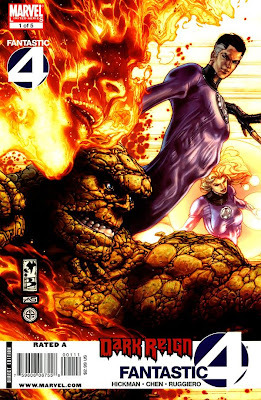 It could be because I didn't keep up with the Dark Reign event in the Marvel Universe, or it could be because it's sort of weak, but I didn't enjoy Dark Reign: Fantastic Four. Compiling 5 issues of the title, the events of the book find some of the Four lost in time, for lack of a better description, and Reed alone in the lab. The Franklin kids attempt to hold off the Osborn forces but that's really not enough to sustain interest. The best moment in the volume was the Elizabethan (?) Ben Grimm uttering his famous line. The art by Sean Chen was nice in spots but it wasn't enough to save this book for me. An added feature in the trade, "The Cabal", was a good deal more interesting. A few lines of choice dialogue between Doctor Doom and Namor brought a smile to my face. Writer Jonathan Hickman and artist Adi Granov really bring a cinematic feel to these few pages. There's more drama and wit -- see below -- here than in the previous 5 issues with the Fantastic Four.